1) Durga Shailputri Mata: Shailputri means the daughter of the mountain, Himalaya. 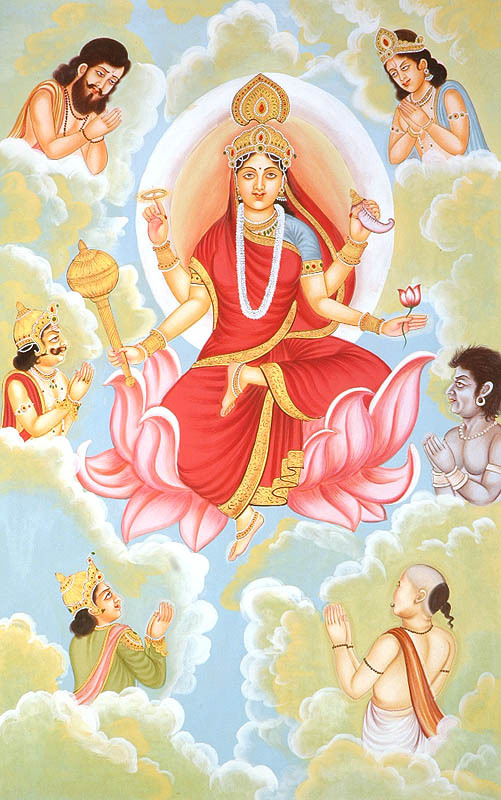 In this form we see the divine Mother holding a trident in her right hand and a lotus on her left. She is seen seated on an ox. In her previous birth, she was called Sati, Bhavani and was the daughter of King Daksha. After a lot of penance, she married Lord Shiva. 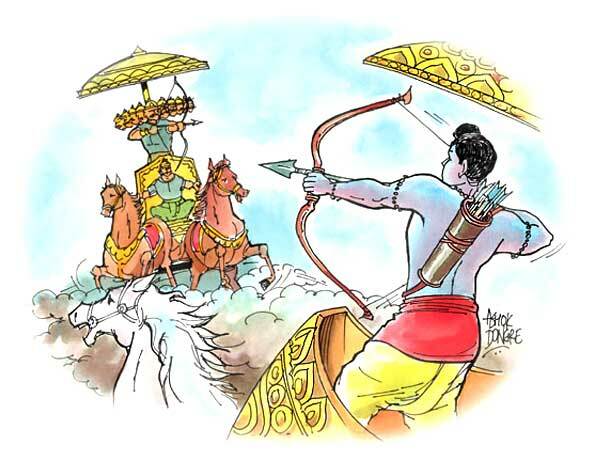 But her father King Daksha was not too pleased. He had arranged for a Yagya/Yagna (Ritual done around the sacrificial fire) where he invited everyone except his son-in-law, Lord Shiva. Upset and feeling humiliated, Sati decided to attend the event uninvited. There, her father insulted Lord Shiva and in fury she stood on the sacrificial fire and burnt herself alive. Lord Shiva enraged, ordered his followers to demolish the Yagya. Sati was reborn as the daughter of the king of the mountains, Himalaya in the name of Parvati – Hemvati and got married with Lord Shiva again. Her this Swaroop is worshipped on the first day of the Navratri celebrations. 2) Brahmacharini Mata: Brahmacharini or Tapasyacharini is Goddess’s second form. The name holds the meaning of true penance and meditation. Her form depicts her holding a rosary beads in her right hand and a Kamandalu, a pot containing holy water in her left. In her previous life, when she was reborn as the daughter of Himalaya, she performed severe penance to have Lord Shiva as her husband. Narad Muni, the divine sage advised her to take up meditation to win Him. Her intense devotion, steadfastness and strict meditation for years under extreme conditions, gave her the name of Brahmacharini. 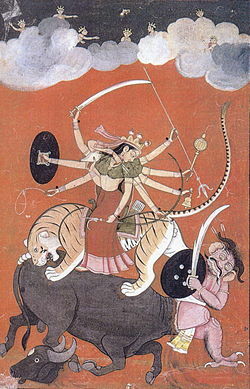 3) Chandraghanta Mata: Goddess Durga’s third form is known as Chandraghanta or Shakti. Chandra means moon and Ghanta is the bell. This name finds its explanation in the half-circular moon on the temple of the Goddess that resembles a bell. She is three eyed with ten hands. Each hand holds ten different weapons. 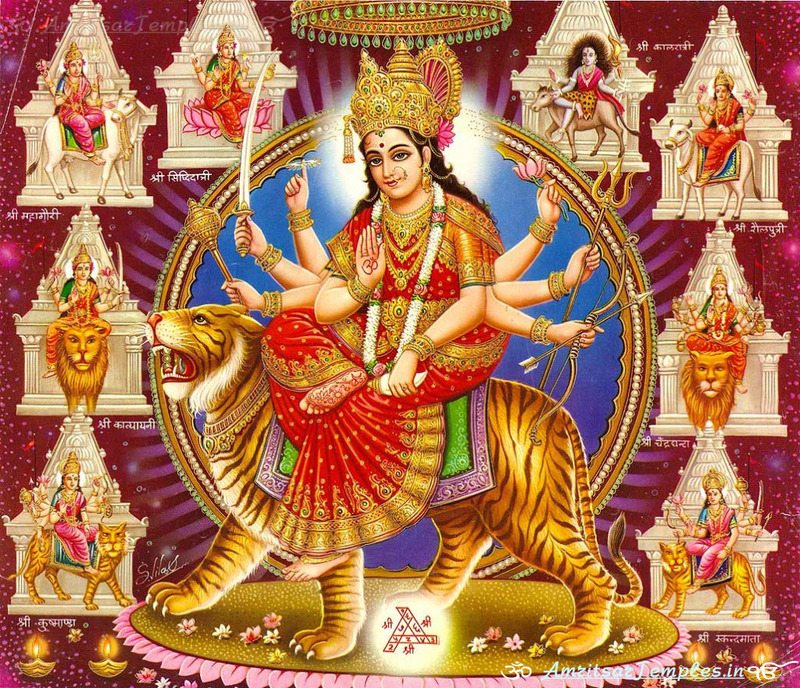 She is seated on lion and is worshipped on the third day of the Navratri celebration. Her hue is golden and her appearance always spreads a calm and eternal peace all round. She is unprecedented image of bravery. The frightful sound of her bell terrifies all the evil and demon. Worship of this deity helps to eliminate the sorrow, hazards and dangers in ones life. 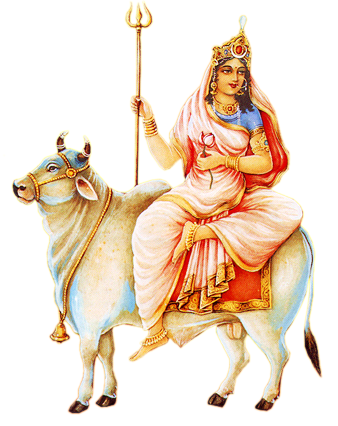 4) Kushmanda Mata:Kush means happiness and she created the universe with a smile. She is radiant as the Sun and rides a lion. 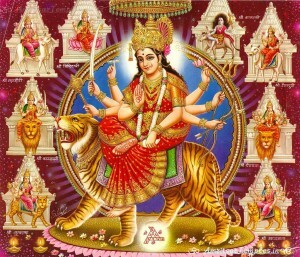 She is Ashtabhuja or eight handed. Her seven hands hold the holy pot, Kamandul, a bow, an arrow, a lotus, a pot containing wine, a disc and a club. The eighth hand holds a string of rosary beads that is believed to provide success and prudence. 5) Skanda Mata: Lord Kartik/Kartikeyan/Karthikeyan is also known as Skanda. 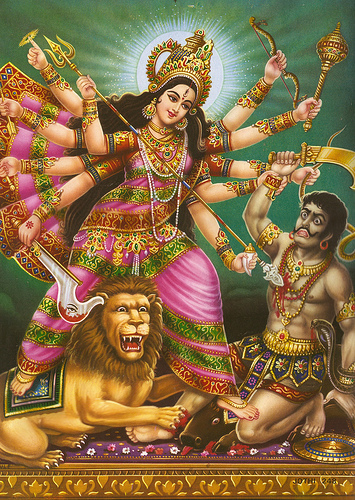 As Goddess Durga is his mother, she is referred to as Skanda Mata. She is a deity of fire with four arms. 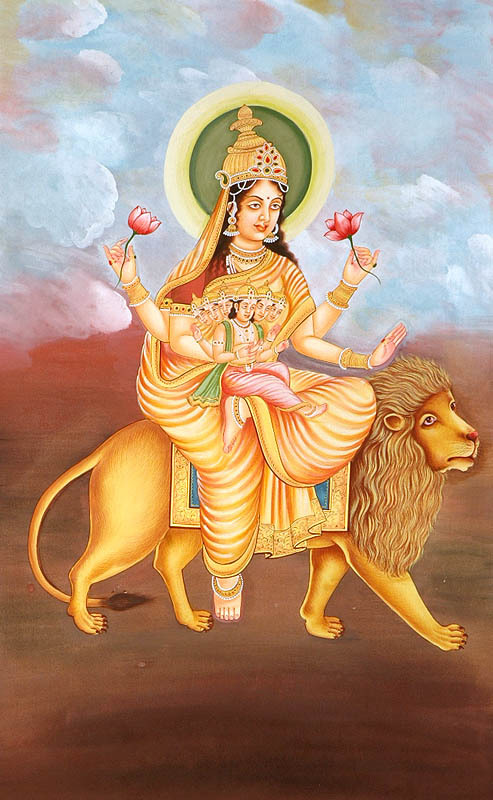 She holds her son Skanda with the top right hand and lotus in her lower hand. The top left hand is positioned in a blessing gesture or Abhaya Mudra. She is fair complexioned, seated on a lotus and so also referred to as Padmasana. 6) Katyayani Mata: Sage Katyaayan was the son of the great sage Kat. He observed rigorous penance and worship of Bhagavati Paramba with a desire to get Paramba as his daughter. His wish was granted. The daughter born was named Katyayani. She has four hands. The top right hand is positioned in a gesture of providing courage while the other hand is positioned in a gesture of rendering a boon. The top left hand holds a sword and the other a lotus. The goddess rides a lion and worshiped on the sixth day of the Durga puja. 7) Kalratri Mata: Ratri means night so her complexion is as dark as the night. She has long, unmated hair with her three eyes that are shiny and bright. She has four arms and is seen mounted on a Shav/Shava or dead body. Her right hand holds a sword, while her lower hand is in a blessing stance. The left hand holds a burning torch and the lower left hand is in fearless position. 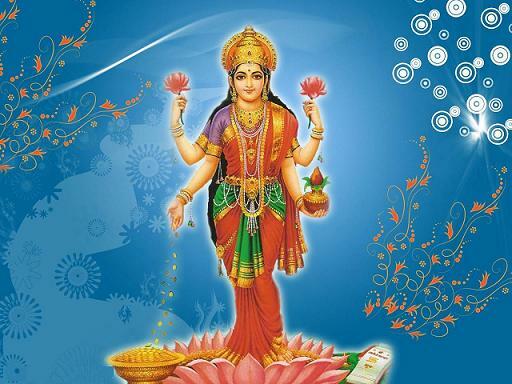 She is known as Shubhamkari or the auspicious one. Her form encourages her devotees to be fearless. 8 ) Maha Gauri Mata: It is said that when the body of Goddess Gauri got dirty due to dust and earth while she was observing penance to attain Lord Shiva. So he cleansed her with the holy waters of Ganges. Her body transformed into bright and luminous like lightening and so her eighth form is known as “Maha Gauri” .Her clothes and ornaments are also white. Her visage is calm and peaceful and she is three eyed. She rides on a bull. Her four hands denote different meanings, like the left hand is in the fearless gesture and the lower on holds a trident. The above right hand has tambourine and lower right hand is in blessing style. 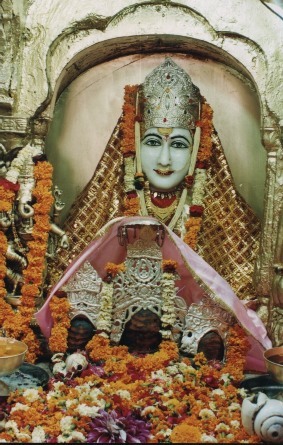 9) Siddhidatri Mata: The ninth form is Siddhidatri. There are eight Siddhis (Special powers which can only be attained from severe penance and meditation)-Anima, Mahima, Garima, Laghima, Prapti, Prakamya, Iishitva & Vashitva. Maha Shakti gives all these Siddhies. 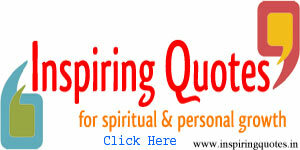 It is mentioned in the Devi Puran” that Lord Shiva got all these Siddhis by worshipping Maha Shakti. With her gratitude, Lord Shiva’s body also contains the Goddess and so he has the form and name of Ardha Narishvar. Ardha means half. The goddess rides on a lion. The Siddhidatri form is worshipped by all gods, rishis, munis (Saints and Sages), siddhas, yogis, sadhakas (Devotees) for attaining merit and boons of their severe penances.